All of us at Archadeck Outdoor Living are excited to announce the launch of the new and improved Archadeck.com aimed at providing visitors with a user-friendly more beautiful experience. Archadeck.com opens to a clean user experience with large scrolling images of some of Archadeck’s favorite projects. Throughout the entire site you’ll see images of Archadeck’s outdoor living designs including decks, porches, patios, sunrooms, outdoor kitchens and more. You’ll also have the option of connecting with Archadeck through our “how can we help” form. Let us know what you’re interested in and your local office will reach out to you as soon as possible. The site’s main navigation makes it easy for the user to find what they’re looking for. It includes: design ideas, why Archadeck, our process, about us and connect. Design Ideas is where users can go to get inspired by some of our best outdoor living projects. Separated into categories, we’ve put together photo galleries of all types of outdoor living spaces, be it front porches and porticos and wood decks to pergolas and outdoor kitchens. Feel free to pin or share your favorite images so it’s easy to find them when you’re ready to enhance your backyard! Why Archadeck will illustrate what sets us apart from your typical deck builder and guide you as you hire a local builder. Take a look at our “Choosing a Contractor” checklist to ensure that you’re hiring a designer and builder that you can trust with your property. And, if you aren’t sure if you need a new deck, take a look at our deck safety page. We’ll show you what you can look for to evaluate if you should reach out to a professional to inspect the safety of your outdoor living structure. Our Process is simple: we’ll walk you through the steps of what it’s like to work with Archadeck Outdoor Living in five simple steps: Connect, Consult, Design, Build and Enjoy! 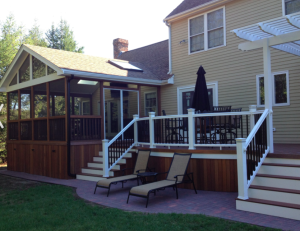 Specific information about Archadeck Outdoor Living can be found under our “About Us” section. We’ll tell you our story, share testimonials from our happy clients, introduce you to our preferred partners and answer some of our Frequently Asked Questions. Lastly Connect, a section dedicated to connecting with us, our sister brands and our online outdoor living magazine. Throughout the entire site, if you are interested in finding your local Archadeck office, simply enter your zip code in the top right and instantly be redirected to your location’s page if one is available. We invite you explore the new Archadeck.com. Updating and enhancing your outdoor living space is a big decision and can be a big investment. As you go through the process, you want to be confident that the final product will be a space that you love. At Archadeck Outdoor Living, our design process is incredibly important to ensure that the right structure and space is built, leaving you with an area you’ll enjoy and use. How do you intend to use the space? It’s easy to say “I want a bigger deck,” but that’s too simple. Getting a clear understanding of how you’d like to use the space makes form and function a goal. Someone who wants to have a glass of wine on an outdoor couch needs a different type of space than the homeowner that hosts large parties and eats in the backyard every night. The more ways you want to use the space, the more planning that’s involved. For example, if you want to use your outdoor space into the night, it makes sense to plan for outdoor lighting and a fire feature. What’s the topography of your yard? Do you have a flat yard? Does it slope? The topography can make a big impact on the best structure types for your property. If you have a large slope or your main living floor is higher off the ground, a deck may be the best option. Flat land is more forgiving in structure type, be it a deck, patio, porch or other structure. Do you have favorite views of your property? If you love looking out onto the rolling hills to the east of your home, your deck designer and builder should create a space that allows you to appreciate that. 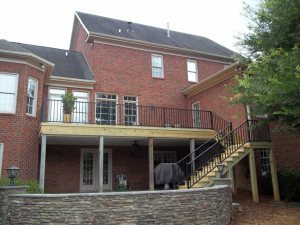 Where and how the deck, porch or patio is built impacts your view. How is your property situated? Do you need area for shade and sun? Some people like to spend time in the sun, while others prefer the shade. If you like the shade, why have a deck that’s in direct sunlight most of the day? It doesn’t make sense. Archadeck Outdoor Living often combines projects to fulfill both needs. 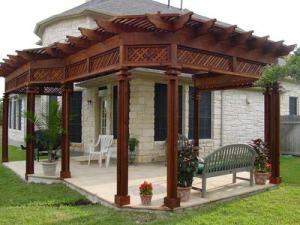 You may have a porch that leads to a patio or a deck with a pergola. Getting the perfect outdoor living space really depends on your preferences. We often ask our prospects and clients to download and fill out our FREE Design Guide to help guide our conversations. If you have questions on enhancing your backyard, please contact your local Archadeck Outdoor Living office. What does your dream backyard include? Is it a deck? Porch? Patio? Or maybe it is combination of several structures? For me, I’d love a screened in porch that opens up to a deck or patio with an outdoor kitchen and fire pit. That’s the dream. Combination projects are a great way to create more space and designate different areas for different purposes. Here are three combo projects from Archadeck Outdoor Living to give you an idea of how multiple structures can work together. 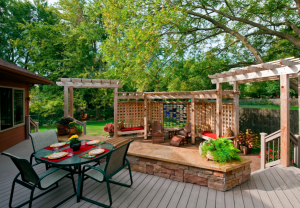 This first outdoor living space includes a deck, patio and a multilevel pergola. While it’s pretty open, the different structures serve different purposes. The deck is mainly used for dining, while the patio is the area where people sit back and relax or chat with friends and family. Changing up the material and level creates the delineation of the spaces. The dining area is just a few steps up from the patio. Keeping the two spaces together is the retaining wall that incorporates colors from both the patio and the deck. Our next example truly does have it all: a deck, open porch, stone patio and custom fire pit. Who wouldn’t want to spend time outdoors here? While designing this combination project, the Archadeck team had to consider all the different ways that owners use their outdoor space and how it can work together without taking up all of their property. First was cooking. They love to eat and dine outdoors. This was the easy decision in the design as it didn’t make sense for them to have their grill down a flight of stairs instead of right outside their kitchen door. The elevated deck created a covered space large enough for an open porch underneath. A rain decking drainage system was installed to keep the space dry so the owners could install outdoor furniture and a TV in the space for entertaining. And who wants to be forced inside at night? To fix that issue, Archadeck designed and built a custom designed fire pit on the patio. The final example was created for owners who wanted space for sun and shade, so this screened porch, deck and patio combination was designed. The screened porch provides the shade and area away from mosquitoes from the homeowners. It has plenty of space for an outdoor living room set to host friends and family. The deck’s main purpose is dining. The lower level patio was designed as a place to lounge and enjoy the backyard. 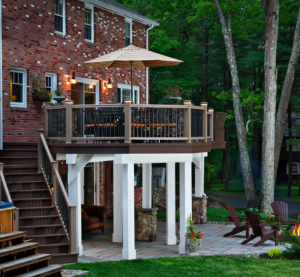 If you’re considering updating your backyard in 2015 or later, please contact your local Archadeck Outdoor Living office. We’re confident we can help you create the backyard of your dreams.